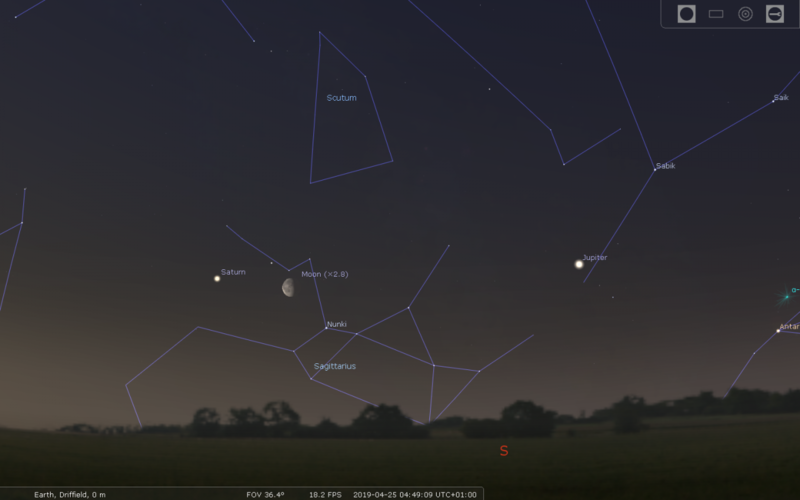 Mars is the solitary naked eye planet visible in the evening sky this month, but is now losing its battle with the encroaching twilight. 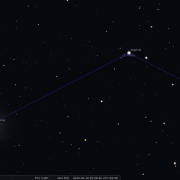 Look for the red planet on the 4th and 5th as it glides up between the Pleiades and the Hyades, highlighted by Aldebaran (the ‘eye of the bull’). 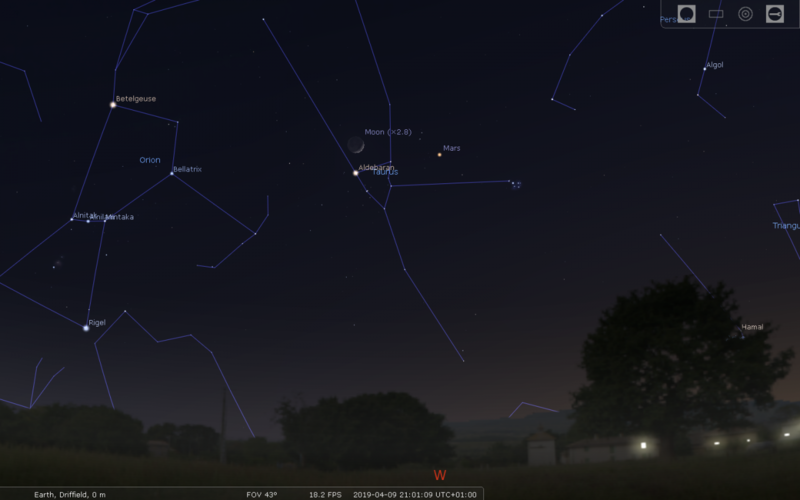 A waxing crescent Moon lies in proximity on the 9th. 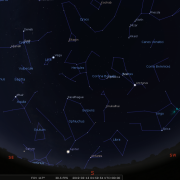 Mars continues to move up through Taurus, as the bull descends down toward the WNW horizon, and ends the month almost between the ‘horn stars’; zeta and beta tauri. 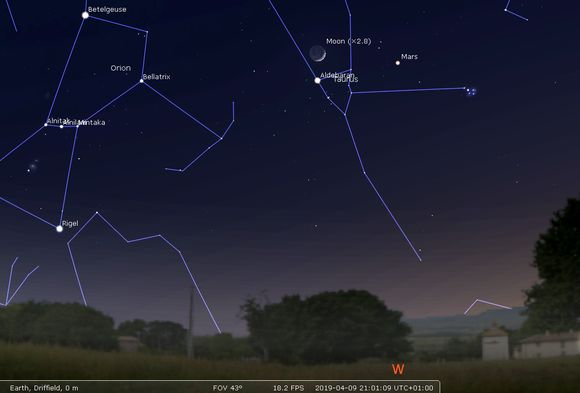 09-Apr-2019 at 20:00h (West): The Moon and Mars. Click for full-sized image. 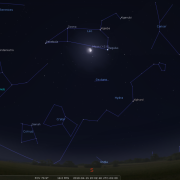 The early dawn sky is home to the majority of the bright naked eye planets. 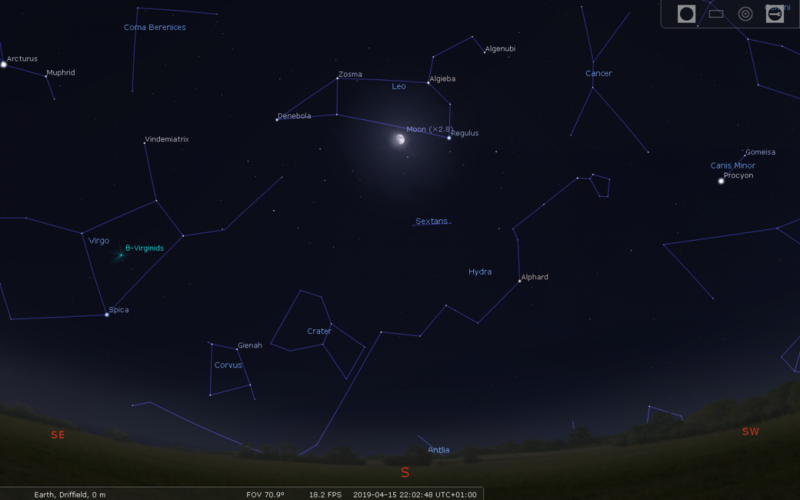 Venus languishes very low to the east horizon and is technically visible all month for less than 30mins before sunrise. 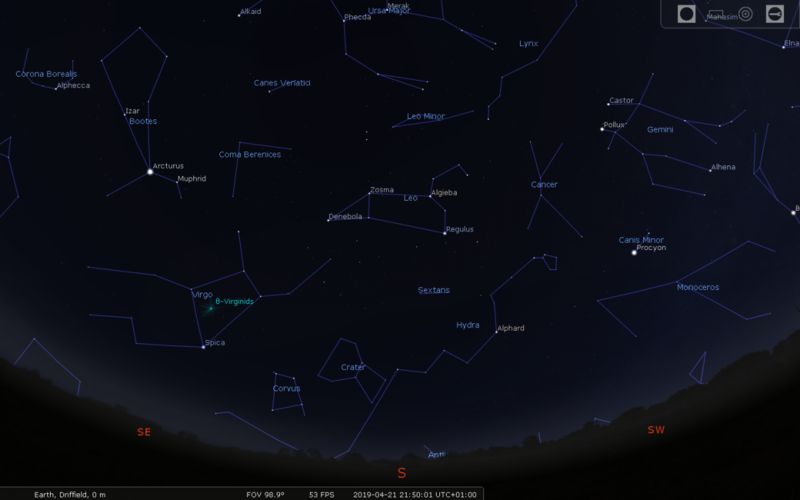 Mercury joins it later in the month, but this a very difficult apparition to view. 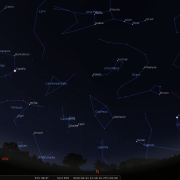 Jupiter and Saturn are better placed for observation and dominate the early morning sky, although they are still rather low, residing on the southerly part of the ecliptic visible before sunrise. 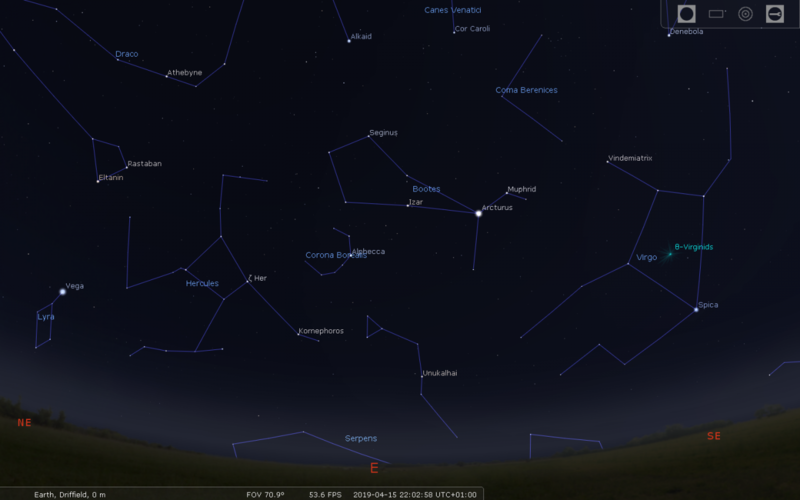 Jupiter is by far the most conspicuous object in the dawn sky and is visible in the east around 02:00h by mid April, lying to the south as morning brightens. 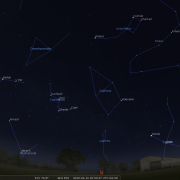 Jupiter resides to the right of the ‘Teapot’ asterism in Sagittarius and reaches its stationary point on the 10th, before commencing its retrograde motion against the backdrop of stars. 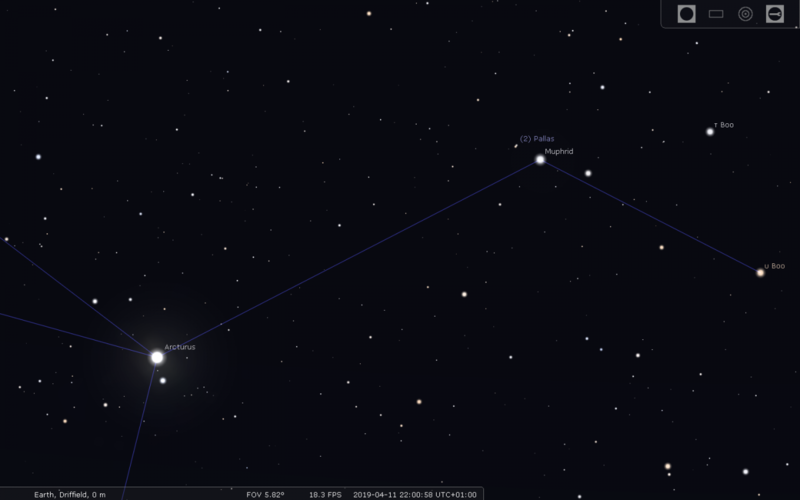 Jupiter will continue to brighten reaching mag - 2.45 by the month’s end with a disc size of 43 arc seconds; large enough for a wealth of detail to be revealed even in smaller instruments. 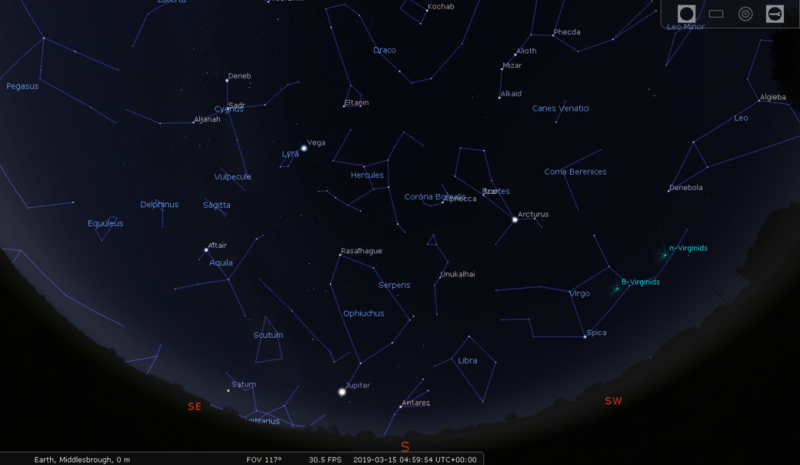 The Moon lies close by on the 23rd and 24th. 11/12th; 13/14th; 18/19th; 23/24th all between 03:00-04:30h. 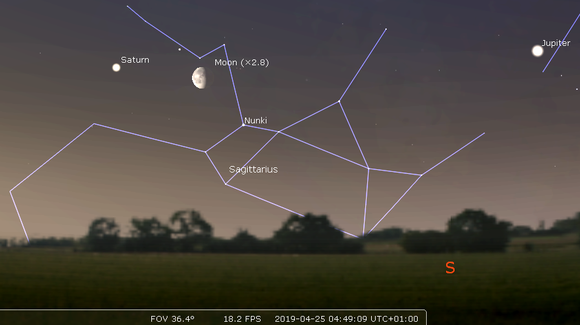 25-Apr-2019 at 05:00h (South): Jupiter, Saturn and The Moon. Click for full-sized image. 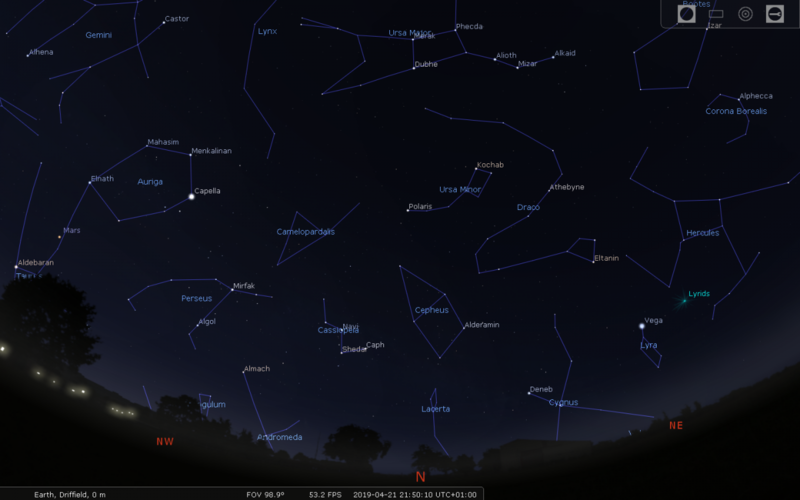 Saturn trails Jupiter into the sky by a couple of hours and is considerably less bright, but still conspicuous to the eye. It resides to the left of the ‘teapot’ asterism - pretty low to the horizon, and observations are going to be somewhat compromised due to our atmosphere. Nevertheless if you have a telescope, your patience at the eyepiece will ultimately be rewarded. 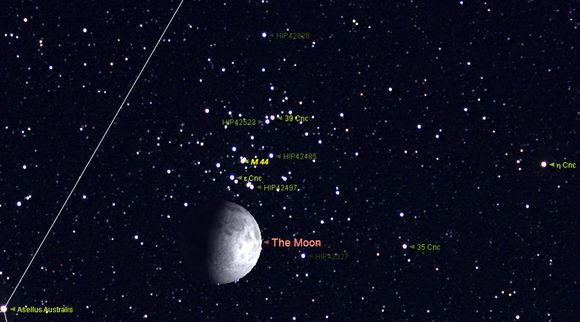 The moon lies in proximity on the 25th and 26th. 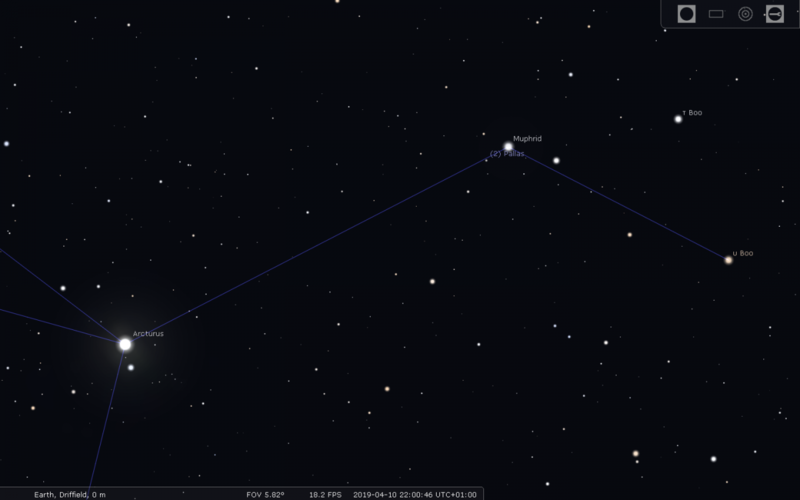 One of the original big four minor planets, Pallas, comes to opposition on the 10/11 April peaking at Magnitude +7.9 and therefore well within the range of binoculars and smaller telescopes. You can track it down very close to eta Bootis or Muphrid in Bootes on opposition night. 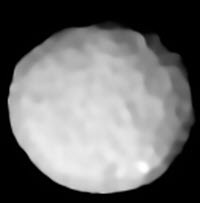 With a diameter of over 500km, it is a big old chunk of rock and if you can observe it for any length of time its motion should be perceptible and therefore an exciting prospect. 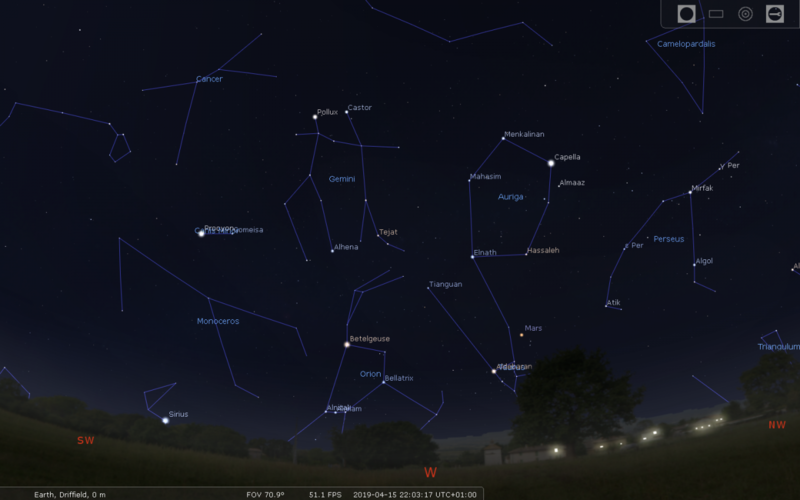 If skies are clear on the night of the 13/14th between 21:00-22:00h, turn your binoculars or a smaller telescope towards moon, and you will notice an obvious gathering of faint stars in the background. This is the Beehive cluster (M44) or Praecepe in Cancer and one of the finest spring open clusters. 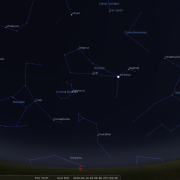 The Moon does actually occult several stars on the southern fringes of the cluster, and with it occurring in the late evening, it should be a fine sight to view. 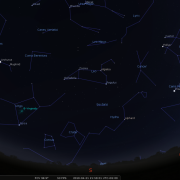 A number of lesser meteor showers occur during April. The Virginids and alpha Scorpiids each have zenith hourly rates (ZHR) of half a dozen, or so, equating to ‘normal’ sporadic meteor activity levels. 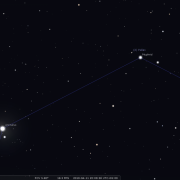 The Virginids peak on April 7/8th, which is a ‘no moon’ window, therefore increased sightings of Virginids during the early morning hours is more likely. 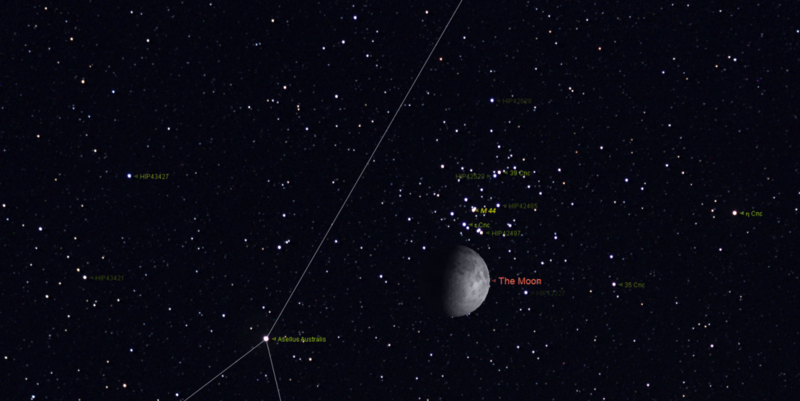 The Scorpiids peak on the 27th and will be hampered a little by a waning moon in the early morning hours. 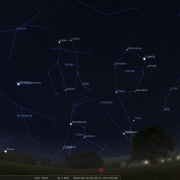 This month’s most prolific meteor shower; the Lyrids, peak during the early morning hours of the 23rd, but as the moon will be rising after midnight, pre-dawn observations will be compromised somewhat by moonlight. 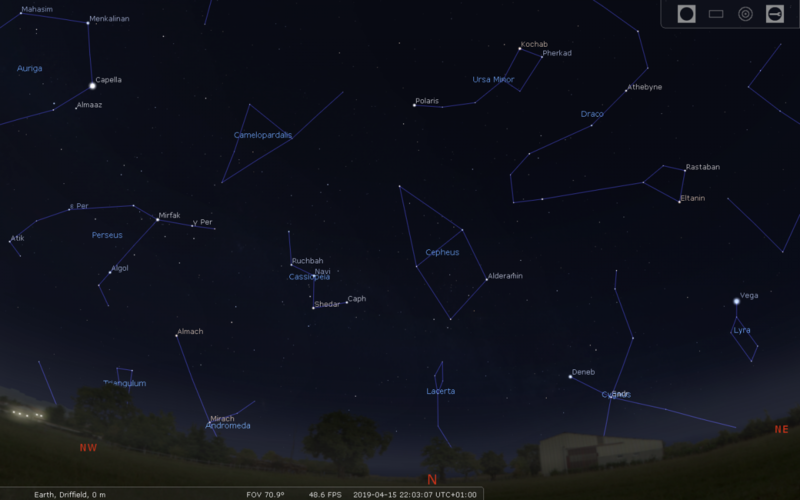 Nevertheless, if you are up and about between 03:00-05:00h, do still keep an eye out for some shooting stars, with upwards of a dozen or so apparent within that period.